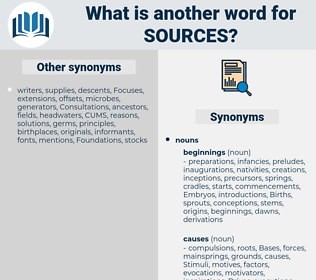 What is another word for sources? provenances, informants, headwaters, informers, Resources. report, emission, emissions, issuance, jerusalem, commission, c., topics, Countries, broadcasts, programming, series, releases, Programs, data, maariv, Gaza, bank, /, hiv, NPS, roots, fonts. 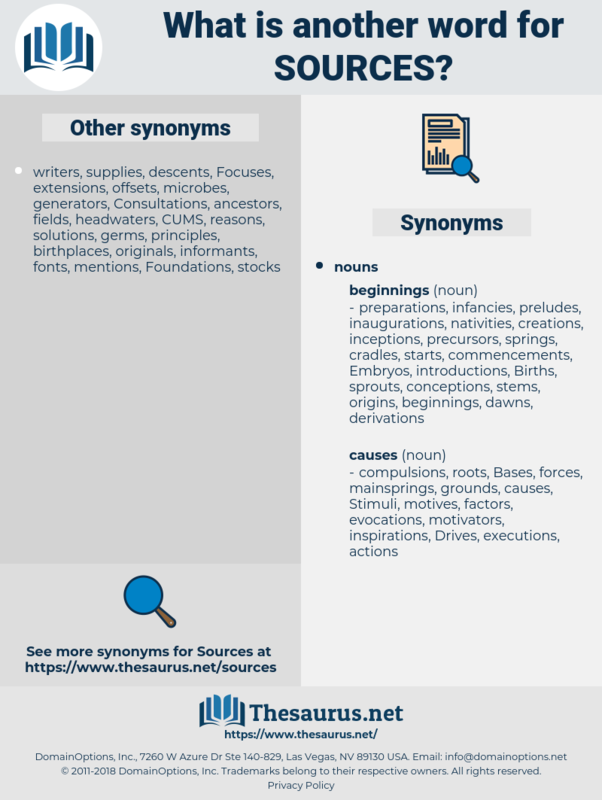 -sources, purposes, factors, courses, reservoirs, matters, occurrences, interlocutors, causes, reasons, excuses, contents, credentials, suppliers, contributors, structures, transactions, forces, considerations, techniques, preferences, concerns, supporters, years, users, substances, processes, generators, supports, reserves, Concentrations, assistance, electricity, consumed, generates, procedures, influences, renewables, proceedings, operations, conversion, backgrounds, Households, producers, Measures, receipts, details, components, perpetrators, exporters, fuels, directorates, mechanisms, issues, leaders, jurisdictions, sectors, instruments, documents, prosecutions, elements, terms, origines, effects, purchasers, investigations, reservations, livelihoods, Records, personnel, ancestries, reports, independence, quarters, officials, solutions, channels, papers, relationships, streams, organisations, relations, creditors, conduits, contributions, organisers, centers, observers, organization, Organizations, Categories, confirmed, others, funders, beamlines, interveners, polluters, waters, professionals, organizers, fertilisers, personages, wells, continuous, institutions, appropriations, investors, respects, services, Possibilities, organs, earners, revenues, earnings, backers, numbers, requirements, Registries, locations, shelters, alternatives, vectors, sponsors, directions, questions, times, counterparts, pretexts, environment, Environments, discussions, troops, devices, instances, subjects, Specialists, Energies, Databases, lessors, methodologies, Incomes, Forests, names, species, sensors, outlets, enterprises, finances, determinants, arrangements, products, practices, methods, provides, routes, projects, regions, emitters, stocks, ways, contractors, SO2, Respondents, collections, registers, aspects, participants, crops, assets, Houses, visitors, stakeholders, Opportunities, systems, pieces, values, Palestinians, residents, Vendors, patterns, rates, materials, Fertilizers, installations, places, dimensions, Efforts, buyers, Risks, outputs, sorts, uses, Laboratories, cases, flashpoints, advocates, officers, Operators, objectives, technologies, Gases, Phenomena, links, Publications, accounts, chances, sites, Personalities, Fisheries, networks, Guidelines, newspapers, fields, importations, clarified, exports, hotbeds, threats, costs, witnesses, Promoters, articles, understand, pollutants, situations, homes, forecasts, compilations, particulars, owners, organisms, workers, motives, primarily, spots, purchases, experts, allocations, Undertakings, combined, increases, auxiliary, Outbreaks, responders, deposits, centres, groups, steps, VOCS, parts, funds, obtains, mobilization, Industries, spheres, Capabilities, panellists, organic, features, authors, exists, doctors, pipelines, Activities, Populations, files, tools, modes, statements, volunteers, allows, Businesses, lebanese, Facilities, Areas, flows, imports, Donors, readings, members, modifications, Investments, Surveys, initiatives, fonds, drivers, people, Branches, inputs, challenges, concepts, benefits, exhibitions, Exercises, settings, hotspots, israeli, Israelis, Negotiations, Foundations, venues, positions, dangers, targets, pollution, landlords, complainants, beginnings, drains, agents, things, Remedies, facts, diplomats, Communities, Universities, incidents, tons, Oils, sulphates, Roles, departments, partners, referees, Forums, Agencies, actors, problems, due, speakers, barriers, analysts, pockets, lenders, messages, fossils, options, pools, points, engines, FACETS, learned, works, internet, discharges, estimates, canals, Tribes, Classes, segments, Bases, talks, levels, claimants, circles, Capacities, bearers, SMES, approaches, fountains, items, east, warheads, Permits, applicants, Vehicles, news, Entities, Ones, individuals, figure, figures, farms, Paths, masses, Journals, players, shows, Forms, fronts, aims, posts, images, marks, exchanges, Families, Companies, heads, how, Sulfates, texts, providers, hazards, Tracks, Inquiries, modalities, dumping, events, markets, actions, avenues, linkages, Plants, shapes, amendments, donations, changes, intakes, annex, born, read, Grants, leads, sinks, PATHWAYS, appeals, media, Mediums, motors, thirds, Bodies, sides, totals, titles, Dioxins, -rrb-, types, Births, Goals, sets, holdings, pleas, Firms, Studies, books, LABS, guys, kinds, Genes, loans, TONNES, trials, PODS, needs, shares, Taxes, buys, Las, melt, gifts, ", ties, units, LANES, 21, hostels, 303, 2002, Parties, 2.3, goods, emissions, jerusalem, LINEs, topics, Countries, broadcasts, releases, Programs, data, Gaza, NPS, roots, fonts. resulting, Creating, contributing, collecting, Including, Generating, following, leading. causes, creates, generates, follows, provides, Generating, leads. The question is frivolous, for the whole trouble in this matter is that there were no sources at all, in the proper sense of the word - good or bad. On the one hand, we can never be sure that we have exhausted all the sources of information; who knows what may be held in reserve by the uncatalogued collections? search, sewerage, shag rug, sargasso, siqueiros, scorch, saurischia, scorsese, scissors kick, SIRC, sage grouse, Skagerak, scheuchzeriaceae, scores, screw jack, susurrus, shears, scissors, ski rack, sucrose, siriasis, screak, serosa, surcease, skreigh, saccharose, seiurus, secrecy, sorex, sea wrack, siris, saururus, sucrase, saragossa, saurosuchus, sourish, serge, sewage works, serax, squark, scherzo, skew arch, shrike, scourge, sirocco, sugar cookie, shire horse, sorgho, Showy Orchis, siracusa, sciurus, scrag, Sargasso Sea, sack race, susurrous, serious, SARS, serous, sikorsky, skreak, sewer gas, sazerac, shriek, Sirach, scrooge, saururaceae, ski race, scarce, sayers, sericeous, sirius, screw key, squaw grass, screech, Skagerrak, sorgo, shiraz, shrewish, sea horse, seahorse, seagrass, shirk, syracuse, sorus, sarawak, shrug, series, shakers, sawhorse, squarish, squirearchy, screechy, surge, screaky, scours, scraggy, saccharase, shark.